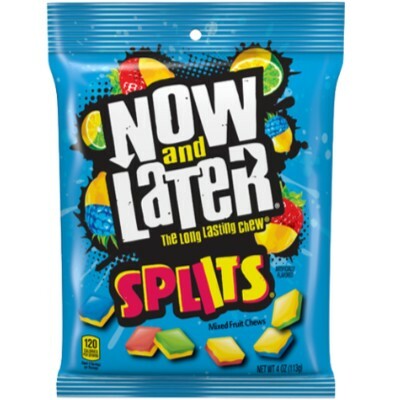 Enjoy double the flavors for hours on end with the sweet and unique taste of Now & Later Splits. Each piece of taffy combines two fruity flavors for a sweet-and-tart treat that's designed to refresh your senses and satisfy your sweet tooth. 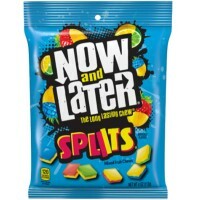 individually-wrapped pieces make this treat ideal for on-the-go snacking. Corn syrup, sugar, palm oil, acidity regulator E330, salt, egg whites, artificial flavors, potato starch, soybean lecithin (emulsifier), colors E102*-E129*-E133, contains egg, soy. *May have an adverse effect on activity and attention in children. Nutrition facts (for 100g): calories 600Kcal, total fat 5g (saturated fat 0g), total carbohydrate 95g (sugar 95g), protein 0g, salt 0.4g.